Dogs may have difficulties cooling down their body temperatures during warm weather. The AFP Ice Bandana is a collar that was specifically designed for dogs and offers refreshment on warm summer days. 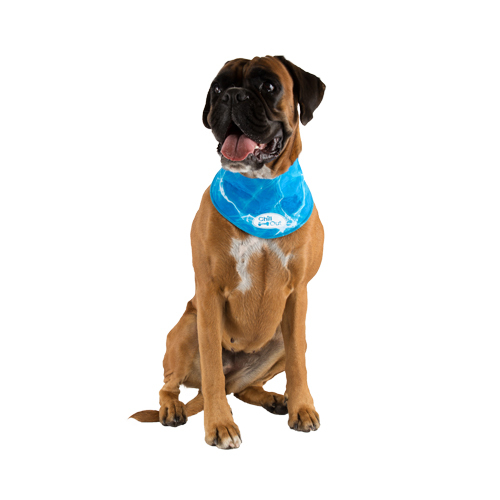 The bandana is made of special materials that absorb water and cool your dog, simultaneously. It can easily be fastened around your dog’s neck using the Velcro fasteners. Dogs can easily get overheated as the only way for them to cool down is by panting or through a limited amount of sweat glands in their paw pads. Because of this, a hot summer day may result in your dog overheating or even contracting heat stroke. The Chill Out Ice Bandana absorbs cool water when placed in it, which helps cool your dog’s entire body on sunny days. The handy velcro fasteners make it easy to secure around your dog's neck. All you have to do is hold the bandana under a stream of water for a short period of time. After this you can put the bandana on your dog. Repeat every couple of hours. What if the AFP Chill Out Ice Bandana doesn't fit? To check whether or not the AFP Chill Out Bandana fits your pet, you can take the item out of the package and hold it up next to your cat. This will allow you to see whether or not it fits. For hygienic reasons, this item cannot be returned if it has been in direct contact with your pet. Should we conclude that the bandana is stained, has been worn, is covered in hair, smells bad or has been washed once the item is shipped back to us, it will not be returned to you. In this case, the item will be given to a local charity. Unfortunately, we have to apply these rules as we are often confronted with products that have been returned in a used condition. Have you used AFP Chill Out - Ice Bandana before? Let us know what you think about this product. I am at a loss to understand how this bandana, after soaking in cold water, provides any benefit to my dog in this hot weather. It is not worth the money and I wouldn’t recommend it. My dogs loved these. Easy to use, just let them soak up the water and put around the dogs neck. They are a good fit with the Velcro strip and kept my dogs nice and cool. They forgot they were wearing them so keeping them on wasn't an issue. The bandana does not retain the "cooling" properties for very long. I also have a jacket and this is brilliant but I cannot recommend the bandana.